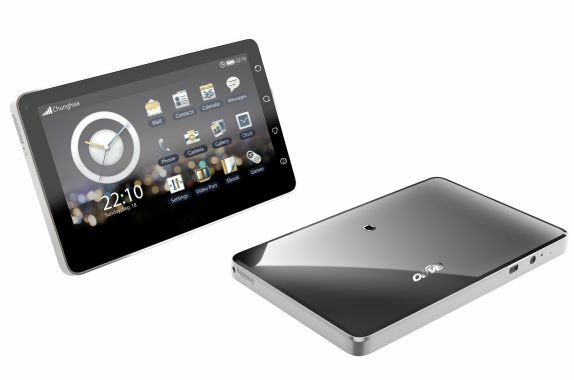 The OlivePad tablet is basically a large Android mobile, just like the iPad is essentially a large iPod Touch. It comes preloaded with Android 2.1, and there’s no difference in functionality between this and any high-end Android phone. Olive has incorporated a customized UI, so viewing media and email is a more streamlined. The 7-inch widescreen multi-touch display (capacitive) isn’t the sharpest, but typing is very comfortable. A 3-megapixel camera is placed dead center at the rear, and a secondary front-facing VGA camera is provided for video calls. It has just 512 MB of internal storage, but a 16 GB microSD card is bundled. It also features a SIM (GSM or WCDMA supported) card slot. It runs on a Qualcomm MSM7227 chipset with a 600 MHz processor, and the UI was mostly smooth, but buggy in places. The accelerometer isn’t responsive at all and pinch-zooming was not fl uid enough. The device is 3.5G-enabled (along with EDGE/ GPRS), along with Wi-Fi connectivity. You can also use its onboard GPS with Google Maps. This is a great piece of hardware for people who want to travel really light and still have access to the Internet wherever they are.At price of 25k,it is better that you buy Ipad.